As promised, and as you can see, we now have a new look. Apologies for taking so long to get it live but, as usual, there have been a number of technical issues! With luck we are over them, but you never know! The change was in part forced upon us by changes to our ISP's infrastructure, and rather than re-jig the old site to fit, we decided to take the opportunity to change the layout which we have had since August 2005. It is not yet totally finished, but will have plenty more for you to see by the start of the 2013/14 season. 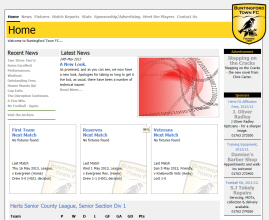 We hope you enjoy this, the third iteration of the club's website!